MARQUETTE — He was a man remembered for many things, specifically, taking care of a city that meant so much to him. Every day, Phil Niemisto was seen washing windows up and down Washington Street. “He took a lot of pride in our downtown, and it’s going to be unusual not to see him walking on our sidewalks,” said Mona Lang, Executive Director of the Marquette Downtown Development Authority. On Sunday, Phil passed away at the age of 88, after being diagnosed with cancer only a week before. But the people of Marquette aren’t mourning the loss, rather celebrating, cherishing the memories shared with him. Even before his death, Phil and his legacy were cemented in the city of Marquette, with a statue in his very own pocket park, immortalizing his kind soul, arm outstretched, welcoming anyone looking for a conversation. 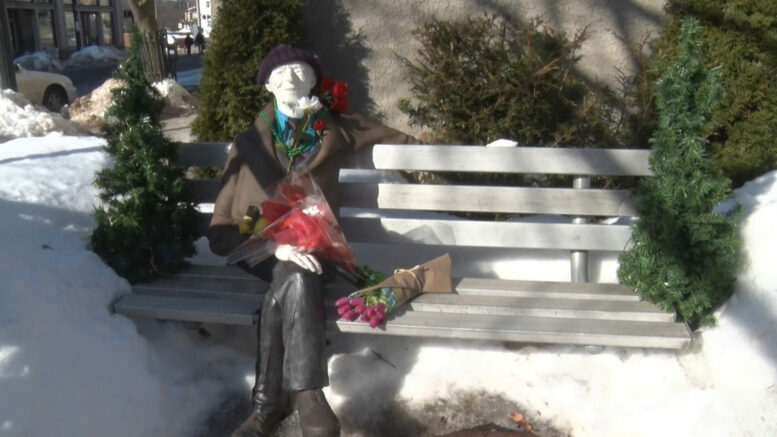 Today, flowers for Phil, bright tulips resting in his lap, waiting to be joined by hundreds more in the spring. I asked Peter to describe Phil using one word: a tough task. He couldn’t. Phil’s friendliness and outgoing personality shaped the way Marquette is today. “I think our community is really giving, and they really appreciated what Phil meant to the city, the community and our downtown,” said Lang. Phil lived each day to the fullest, leaving behind not just a pocket park full of memories, but a lesson to be learned by many. As many people have said, Phil will have plenty of windows to wash up in heaven.